As promised, here’s a little Kingfisher sketch. Animals are easier for me to do, as tiny mistakes in proportions are more forgivable. 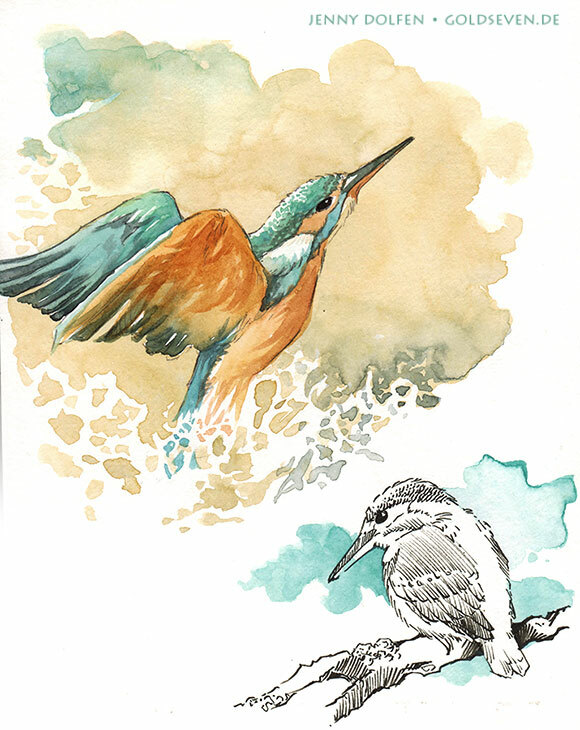 I’ve loved kingfishers since I was young – I was lucky enough to see one once, sitting at a canal near the North Sea where I lived. I think I was around eighteen. I’d packed a Tolkien book and cycled a few miles down towards the sea, where I sat down against a tree at a small canal and started to read. From the corner of my eye, I suddenly saw something flash, brilliantly colourful, and disappear into the water with a little splash. As I watched, I saw a little kingfisher reemerging and fluttering back to his perch in the rushes. It’s one of my most cherished memories, actually. My mother envies me that one to this day.